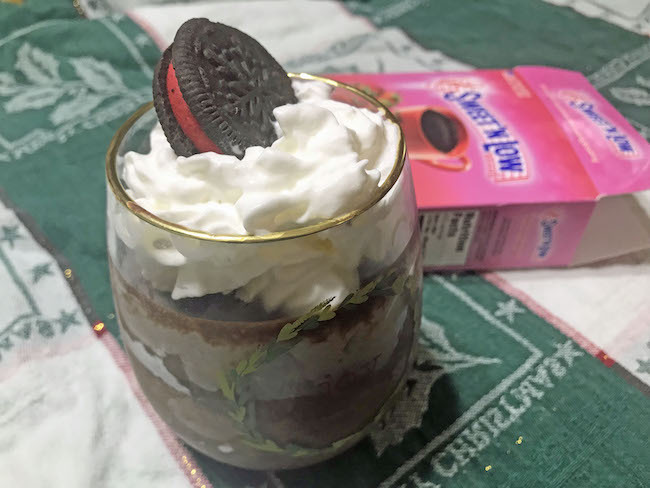 You are here: Home / My Recipes / Easy Chocolate Mousse Parfait Recipe – Celebrate the 12 Days of Christmas with Sweet’N Low®! 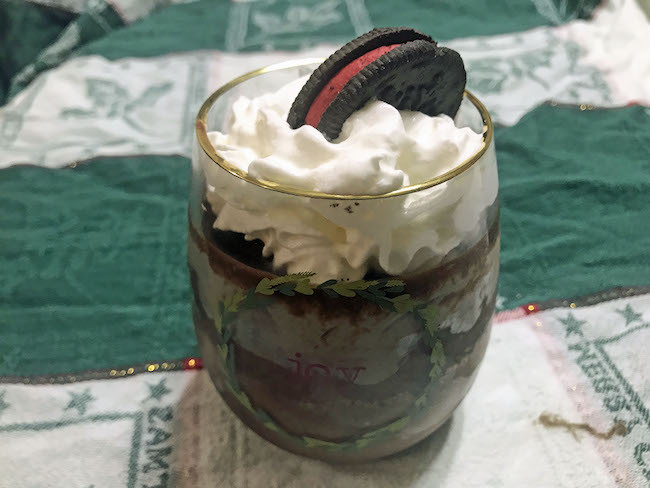 Easy Chocolate Mousse Parfait Recipe – Celebrate the 12 Days of Christmas with Sweet’N Low®! This post is sponsored by Sweet’N Low®. Please note that, as always, any personal opinions reflected in this post are my own and have not been influenced by the sponsor in any way. Can you believe that Christmas is merely weeks away? Where has the year gone! The stores are filling with holiday shoppers and getting busier and busier. Signs of Christmas are everywhere. All that’s left to appear widely is the Christmas carols, which will be coming any day now. Counting down the days to Christmas has never been sweeter! 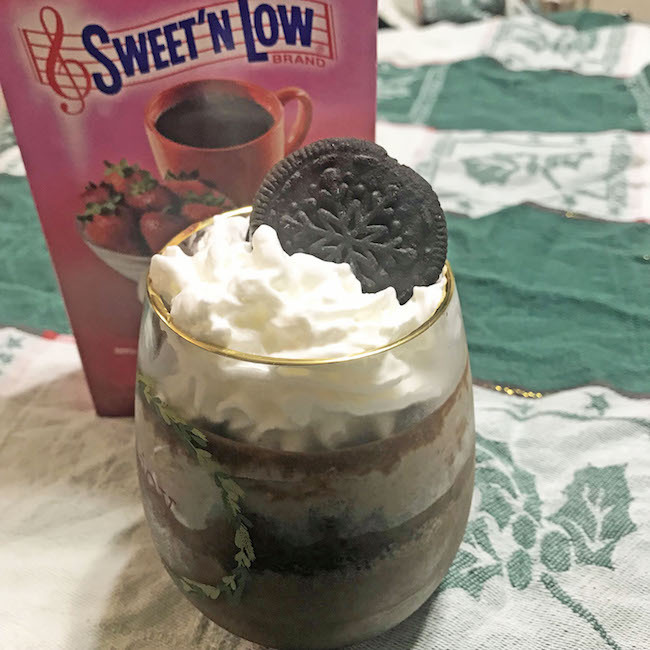 This year, I’m singing along to “12 Days of Christmas” with Sweet’N Low® and celebrating the holiday season with a new recipe inspired by the classic song! My recipe for the sixth day – Six Geese A Laying – is sure to have you caroling with us! When I got to thinking about sweet treats made with eggs I wasn’t sure what to make. After all, there are a lot of great things made with eggs. I was looking to keep things simple, and that’s when I realized that chocolate mousse would be a perfect fit. 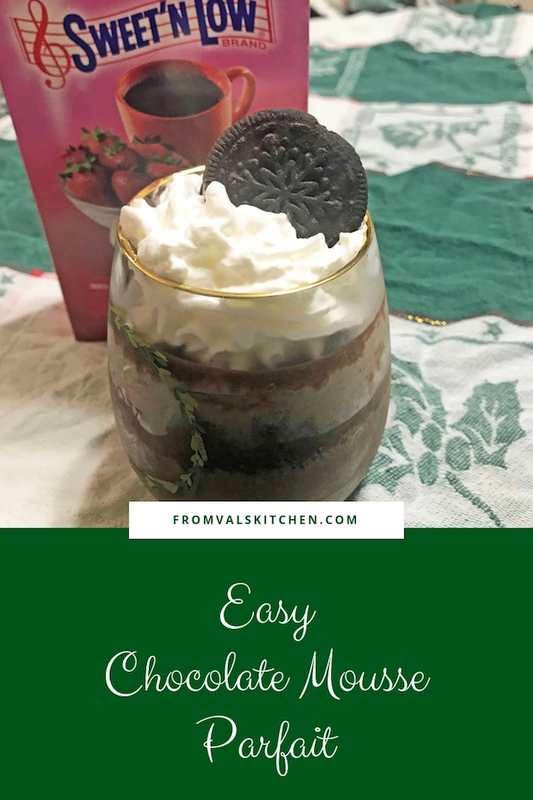 This easy chocolate mousse recipe requires only a few ingredients that you either have on hand or can easily get at almost any store. Chocolate, cream, sugar and eggs, then some holiday cookies for texture. A simple combination that makes a heavenly sweet treat. Counting calories and wanting to skip the sugar? No worries! Sweet’N Low® substitutes for sugar perfectly! Sweet’N Low® has been helping millions of people around the world sweeten food and beverages without added sugars and unnecessary calories. One of those familiar pink packets of zero-calorie sweetener is as sweet as two teaspoons of sugar. With 8 teaspoons of Sweet’N Low® being equivalent to one cup of sugar, it’s easy to use Sweet’N Low® to reduce sugar and calories in your favorite recipes. In addition to being able to be used when cooking and baking, Sweet’N Low® easily dissolves in hot and cold beverages. 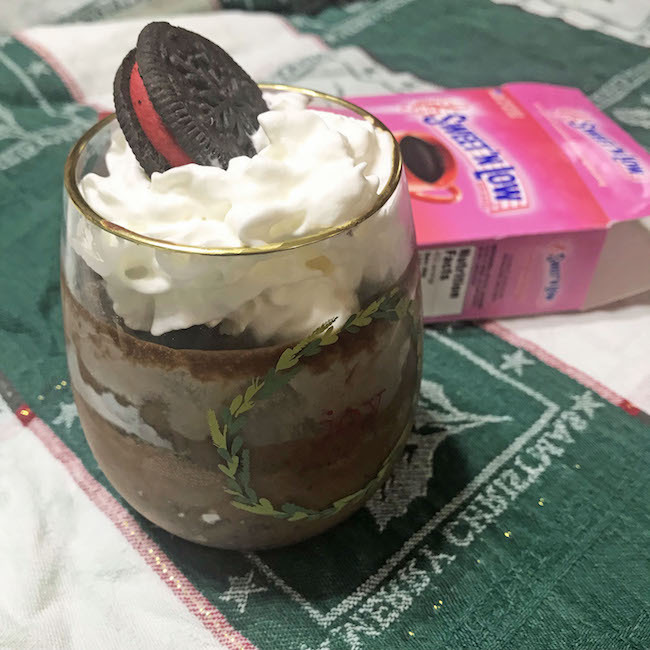 Here’s how I used Sweet’N Low® to make Easy Chocolate Mousse Parfait. This recipe makes 2 large parfaits. Fill the saucepan about a third of the way with water and place on medium heat. Place the chocolate sandwich cookies into a zippered bag and use a meat tenderizer to crush them. Place about a quarter of the cookie crumbs into each glass. Place the chocolate chips into a large glass mixing bowl. You’re going to use this as a sort of double boiler so this bowl should be large enough to fit on top of the saucepan without touching the bottom of it. Pour 2 cups of heavy whipping cream into a second large glass bowl. Whip with an immersible or hand blender until light peaks have formed. Place in the fridge. Place the eggs and Sweet’N Low® into the third large glass bowl. Whip the eggs until they become a thick and fluffy mixture which will take a good 10 minutes. While whipping the eggs, lower the heat under the saucepan and place the bowl of chocolate chips on top of it. Once the chocolate chips have melted and become smooth, add the eggs in and stir well. Take the whipped cream out of the fridge. Remove the saucepan from the stove and slowly add the whipped cream in, stirring well. Gently pour some of the mousse into the two glasses, on top of the cookie crumbs. Stop about half way. Refrigerate the glasses for about 15 minutes. Remove the glasses from the fridge and place half of the remaining cookie crumbs into each glass. Gently pour mousse into the two glasses, on top of the cookie crumbs. Place the glasses into the fridge to set for at least 2 hours, at which point the mousse should be firm instead of jiggly. About 5-10 minutes before you’re ready to serve you’ll need to make the garnish. Pour 1 cup of heavy whipping cream along with the sugar and vanilla into a medium sized glass bowl. Whip with an immersible or hand blender until light peaks have formed. Garnish each glass with some of the whipped cream and a chocolate sandwich cookie. 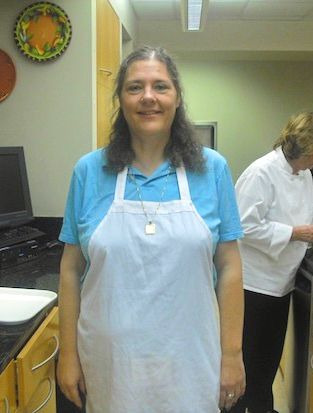 You can also check out other Sweet’N Low® recipes inspired by verses of the song, by visiting the following links. For more information on Sweet’N Low® and for more sweet seasonal recipes, visit www.facebook.com/sweetnlow or the Sweet’N Low® website. You can also keep up with Sweet’N Low® on Twitter, Pinterest, and Instagram. Fill the saucepan about a third of the way with water and place on medium heat. Place the chocolate sandwich cookies into a zippered bag and use a meat tenderizer to crush them. Place about a quarter of the cookie crumbs into each glass. Place the chocolate chips into a large glass mixing bowl. You're going to use this as a sort of double boiler so this bowl should be large enough to fit on top of the saucepan without touching the bottom of it. Pour 2 cups of heavy whipping cream into a second large glass bowl. Whip with an immersible or hand blender until light peaks have formed. Place in the fridge. Place the eggs and Sweet’N Low® into the third large glass bowl. Whip the eggs until they become a thick and fluffy mixture which will take a good 10 minutes. While whipping the eggs, lower the heat under the saucepan and place the bowl of chocolate chips on top of it. Once the chocolate chips have melted and become smooth, add the eggs in and stir well. Take the whipped cream out of the fridge. Remove the saucepan from the stove and slowly add the whipped cream in, stirring well. Gently pour some of the mousse into the two glasses, on top of the cookie crumbs. Stop about half way. Refrigerate the glasses for about 15 minutes. Remove the glasses from the fridge and place half of the remaining cookie crumbs into each glass. Gently pour mousse into the two glasses, on top of the cookie crumbs. Place the glasses into the fridge to set for at least 2 hours, at which point the mousse should be firm instead of jiggly. About 5-10 minutes before you're ready to serve you'll need to make the garnish. Pour 1 cup of heavy whipping cream along with the sugar and vanilla into a medium sized glass bowl. Whip with an immersible or hand blender until light peaks have formed. Garnish each glass with some of the whipped cream and a chocolate sandwich cookie. Serve and enjoy! How deliciously yummy. I can’t wait to make this! this looks oh so rich and yummy! thank you for sharing! I”ve never tried making my own parfait before, but I sure do like eating it! I’ll definitely have to give this a go one weekend. Wow, what a lovely and yummy looking mousse..! Thank you for sharing how to make thse beautiful cups of sweets. omg this looks sooooo delicious and very very easy to prepare, i am making it for sure. Thank you so much. These all look so sweet and cozy; excited to try them this season! oooh this looks so yummy. I can’t wait to try this Chocolate Mousse Parfait. This sounds absolutely amazing! I am going to have to try this out, I have to eat low sugar, so this is perfect! These look so delicious! I love the individual servings. So great for parties! What a decadent looking treat! I love chocolate parfaits 🙂 Great read, thank you. These look delicious! I love making anything that contains chocolate and my kids love sampling my creations! Great choice for the holidays. I can practically taste the rich and creamy chocolate goodness already! Sweet n low is such a great sweetener for recipes! This looks absolutely amazing! I haven’t had chocolate mousse in so long! I will have to give this recipe a try. Ooh I love a good parfait and this one looks absolutely amazing! I love how easy it looks to make too :). Thanks for sharing! Oh my! this looks tasty, and quite easy to make, thank you for sharing! This sounds like a delicious recipe, especially that it’s sugar free! I would love to try it someday. I have given up sugar so I don’t use it at all when I cook. I’ve never heard of Sweet and Low, we don’t have it here in Italy. This chocolate mousse parfait look delicious, I’ll be giving it a try! Ine of our grandkids just got diagnosed with type 2 diabetes and I am a baker! lol It’s time to switch gears and lower sugar or no sugar treats is something I’ve been looking at lately. Yum! This looks soooo delicious! I will try making this at home for the family. They will surely love it!